I love me a good Garge Sale, don't you? 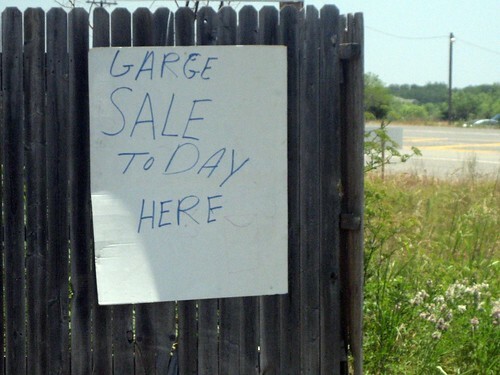 I saw a "3 FLY Garage Sale" sign last week. The work Sale works for me. I like a big arrow to show the way. Most of the time someone uses a pen and writes so small you can not even read it from a distance. I love me a good sael. If they can fly, they don't need to sail. It was on EVERY corner leading up to the house. Made me laugh every time. I am the world's WORST speller...so I guess I see these kind of signs, but don't realize it! Hi Mindy,Just stopping by to say hello and appoligize for the mix up on Davids blog. Silly me:)And I do love your style, that was correct. so great to hear from you. Um my most interesting yet was a few weeks ago someone made the most elaborate signs we had ever seen. All of these cars following each one and ended up to the home and nothing they changed their minds. We were so sad. Have a beautiful weekend ahead. I don't care how they spell it as long as they post their address correctly and open on time! That is pretty much hilarious ! Where I live, I see a lott of sail sinds. But that one takes a cake or two! Thanks for the laugh this morning Mindy!